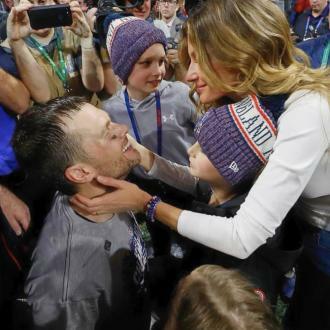 Supermodel Gisele Bundchen has given her American footballer husband Tom Brady a necklace for protection during the upcoming Super Bowl. The New England Patriots quarterback will be playing against the Atlanta Falcons to win the National Football League (NFL) championship at the NRG Stadium in Houston, Texas on Sunday (05Feb17). Tom recently revealed during a promotional event his wife Gisele doesn't like him getting hurt during matches so she has given him a piece of jewellery to wear during the game. Tom and Gisele have been married since 2009 and have two children; Benjamin, seven, and Vivian, four. He also gushed about the Brazilian model, telling reporters: “I’ve been very blessed to find her. Wonderful woman, wonderful partner. She does everything."